Brian’s drinkin’ Belgian(-style) beer to help out some monks in California, Dion’s having 1970s TV flashbacks (pretty much full-time), and J. is re-living the trauma of Ghetto Man roasting the Super Friends. One thing the Podwits all agree on: they sure don’t make ’em like they used to. 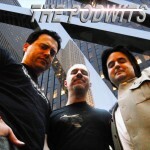 All that and more (including the time Frank Sinatra almost sang a James Bond theme tune) on this latest information-packed Podwits podcast!